Policymakers around the world recognize the potential for natural land area to combat climate change: a total of 97 countries mentioned specific plans to reduce emissions from deforestation or increase forest cover in their Paris Agreement commitments. 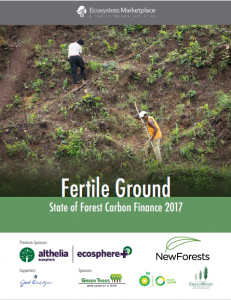 As the international community and domestic lawmakers figure out how to meet their emissions reductions targets in a cost-effective way, many are looking to innovative mechanisms that channel finance towards enhancing the ability of forests and other natural land areas to absorb carbon from our atmosphere. This report details this finance. In particular, we share the latest data and trends for three forest carbon finance mechanisms: voluntary carbon markets, compliance carbon markets, and payments for Reducing Emissions from Deforestation and Forest Degradation (REDD+) programs. For each of these mechanisms, the report covers the volumes and values of offsets transacted, key market actors, and relevant trends and policy developments. We also include information about the projects that receive these payments, how they operate, and how they are influencing the communities and ecosystems around them. Lead report author Kelley Hamrick shares key findings, with guest commentary from Christiaan Vrolijk of Natural Capital Partners, Claire Wigg of ZeroMission, and Julian Ekelhof of CO2OL. Lead author Kelley Hamrick presents Oceania offsetting trends from our new reports, and the following panelists provide on-the-ground insights about what is happening in Australia, New Zealand and the Pacific Islands: Ollie Belton of Carbon Forest Services, Tim Moore of Biodiverse Carbon Conservation, and Sean Weaver of Ekos. • Gareth Turner of Numerco. • Sheldon Zakreski of The Climate Trust. This webinar explores topics like how project developers track and report their co-benefits; how standard bodies are expanding their methodologies to account for co-benefits; what role co-benefits play in marketing and selling forest carbon offsets; and the way in which co-benefits are, or could be, linked to the sustainable development goals.